Here’s a complete step by step guide on how to downgrade iOS 12 Beta to iOS 11 / iOS 11.4 / iOS 11.3.1 on your iPhone, iPad, iPod touch. We know how it is; you download the latest beta, then after a while things start to get a little sour due to incompatibility issues with apps and whatnot. So, if you’ve hit a similar roadblock as well while using iOS 12 Beta, then you might want to downgrade the software back to iOS 11. At the time of writing, Apple is signing iOS 11.4 and iOS 11.3.1. To which firmware you wish to downgrade to is entirely your call. Personally I would recommend going straight to iOS 11.4 as it offers a good range of features such as Messages in iCloud and AirPlay 2. Of course, compared to iOS 12 those features seem paled out, but if you are looking for stability, then you might as well go to a firmware which is the latest one by all means in the public domain. Note: The downgrade process will erase everything off your device. Take a backup using iTunes or iCloud before going ahead. 1. Download iOS 11.4 or iOS 11.3.1 IPSW file and save it to your desktop for later. 2. Launch iTunes and connect your device to your PC or Mac using a Lightning cable. 3. Select your device from the top left hand corner of iTunes by clicking on the little iPhone-like icon. 4. Now click on the Restore iPhone button while holding down the left Option key (Mac) or the left Shift key (Windows). 5. Select the firmware file you downloaded in step 1. 6. If everything goes well, you’ll be back on iOS 11 in no time. Interested in installing iOS 12 Beta onto your device? Then you may want to check out out the links below. 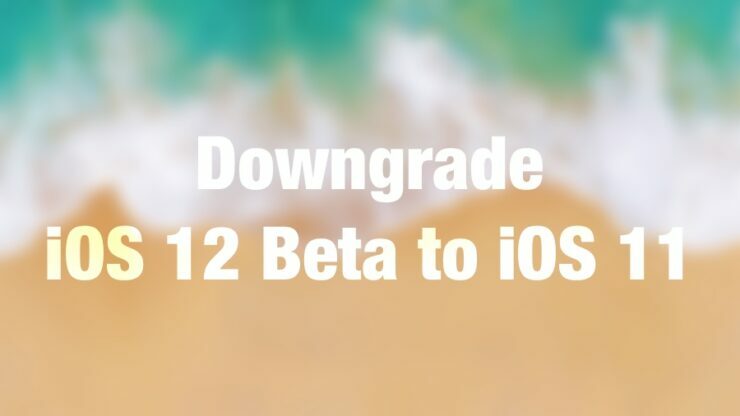 Do let us know in the comments section below why you downgraded iOS 12 Beta back to iOS 11.